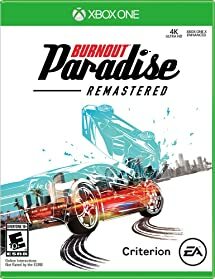 New Game Release: Burnout Paradise Remastered PS4 Xbox One Discounted to $31.99! Pre-orders for Burnout Paradise Remastered are LIVE and available at Amazon! Burnout Paradise Remastered has a scheduled release date of March 16, 2018. Amazon Prime members can take advantage of 20% savings! Make action your middle name as you rule the streets in Burnout Paradise Remastered. Tear up the town from hectic downtown avenues to wild mountain roads. Relive the high-octane stunts and wanton destruction of one of the greatest arcade-driving games ever!Burnout Paradise Remastered provides the ultimate driving playground for you and your friends to play online. This remaster includes all add-ons from the Year of Paradise, including the Big Surf Island update, meticulously recreated and ready to wreck in 4K. Previous PostPrevious Detroit Become Human PlayStation 4 Release Date, Pre-orders LIVE! Next PostNext Recommended New Video Game Release: Sea of Thieves on Xbox One!